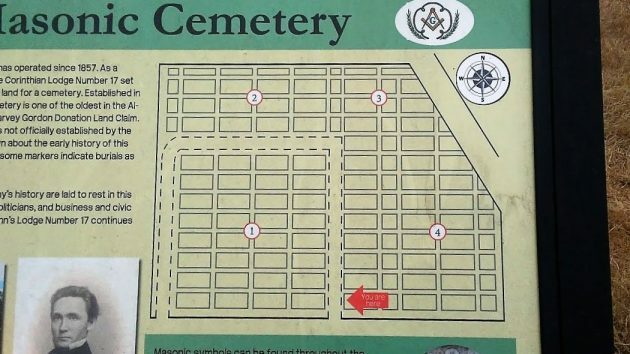 If you look up on this cemetery map, you are looking west, not north as the compass rose claims. Compass directions are a continuing challenge to the makers of this interesting sign, which tells visitors what’s what in the historic Masonic Cemetery off Albany’s Broadway Street. Time went by, as time has a habit of doing. It wasn’t until this week that I got another look at the directions on that map. And sure enough, a change had been made. Unfortunately, it wasn’t a fix, at least not as far as the map is concerned. The compass rose now has north where, on the map, it is actually west. The other three directions are necessarily offset 90 degrees as well. So how about another fix: Turn the compass 90 degrees clockwise and the directions on the rose will correspond to the layout of the cemetery map. This is no big thing, obviously. 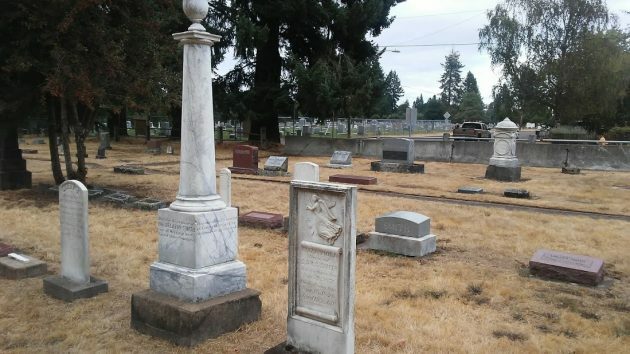 Nobody needs that compass to navigate among the graves or to find one of the more prominent markers, that of Delazon Smith, who helped start Albany’s first paper, the weekly Oregon Democrat, in 1859 and whose portrait is reproduced on the map. This tall monument marks the grave of Delazon Smith. If you don’t know the secret handshake, then you probably won’t understand the secret compass directions…..